From A Rabbi's Perspective I learned He is a power; He can affect our lives; He is caring; He has a will. I learned that Twelve Steps don't just refer to God they tell us about Him. Rabbi Taub taught me that the Steps are already enjoined with certain truths of the Jewish faith. In the post Step Two: Power I learned what the Zohar says of God “Master of the Worlds, You are the Highest of the High, the Causer of Causes.” I learned of God's Power, that in addition to being compassionate, just and wise He is all powerful. In his writing Step 3: Goodness I loved learning about the hashgachah peratis. This is "literally “individualized supervision” but more loosely translated as Divine Providence." How great that this HP works for all! What I learned in the post Steps 5,6,7: Forbearance is we are not looking for forgiveness in these Steps but getting closer to the God of our understanding. 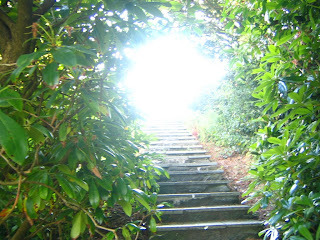 I learned that the 7th Step prayer that I say every morning is about a God who can be counted upon by all who seek Him. In his last post Step Eleven: Will I was drawn to the section about "Knowledge of His Will for Us." It is reassuring to read this section. When he tells the story about the young Jewish man not wanting to get out of bed I heard the message loud and clear. I need to be ready for the day, if I don't suit up and show up God's will most certainly can not be done. I had to really work hard and reread with focus what Rabbi Taub has written here. I can make use of what he offers in more than one way. The biggest use is reading and trying to understand. On the Just for Today card it says "Just for today I will try to strengthen my mind. I will study. I will learn something useful. I will not be a mental loafer. I will read something that requires effort, thought and concentration." If you read the Rabbi's posts you will not be a mental loafer today! The more important way I can make use of Rabbi Taub's writings is to make sure to share them and what I have learned from him with others. I have to pass on what is passed on to me. In reading these posts I have gained more knowledge to apply to my own program and then share it with others. Thank you Rabbi Shais Taub for all you have taught me!